I participated in a lovely ‘Weaver to Weaver 2015‘ project that Meg holds each year. I’ve often seen the little parcels of loveliness that are bestowed upon each weaver who participates in the swap and thought what a lovely idea it is. It reminds of Secret Pal swaps that got me into blogging and knitting over 10 years ago….but smaller. And with less stress. Mine parcel came from a dear friend Miss Sampling….whom happened to be on the list to send to me – twas a small pool of participants this year and the photo shows what wonderful goodies I received. A beautiful sample of her wonderful work (I’m thinking it was on the Saori loom without a reed?? 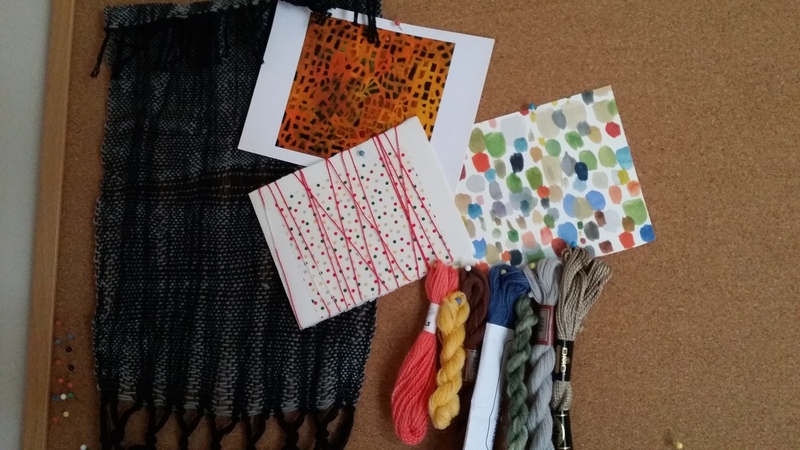 ), plus some lovely postcards of muted colours – with little samples of yarns inspired by one of the postcards. As I said, I happen to know Miss Sampling, and have visited her house….and I am not surprised that she was able to find some samples to send. That lady has the most wonderful Aladdin’s cave of Yarns and fibres that I have ever seen. I covet all of it. Surprisingly, she sent colours – Miss A is def. prone to magnificent creations in subdued hues….so I was happy to see that. Plus a sample of her Kasuri weft – fascinating stuff. And so it has all gone up on my pin board – to serve as inspiration for when I need and want. Many thanks Miss A and Meg for coordinating! Keeper | loomandarty on Oh. My.